Alfonso Cuaron’s Gravity is a neo-realist epic masking as science fiction. Seeing it makes one think of Michelangelo Antonioni and the artist Giorgio di Chirico who was the inspiration for Antonioni’s work. Antonioni was one of the only other directors who could have made a movie about outer space which wasn’t science fiction (Red Desert was probably the closest he came). 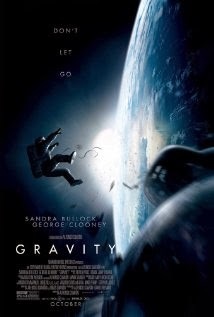 Gravity is literally about space and has some of the qualities of a documentary. The story, hinging as it does on the effect of space debris, is not very far flung. In addition, in most science fiction movies you usually have a big plot and lots of backstory. But this is literally about the effect space has on its two main characters Ryan Stone (Sandra Bullock) a research scientist and Matt Kowalski (George Clooney), an astronaut. The movie is also reminiscent of Waiting For Godot to the extent that the two move in tandem like Beckett’s two characters Vladimir and Estragon, as they seek to survive. In Gravity they are literally held together by a chord. Then the little plot there is unfolds and Bullock is left on her own to seek a kind of salvation and literally rebirth. “Life in space is impossible,” is the mantra of the movie, but Gravity is also remarkably anchored in the probable. Gravity is also reminiscent of Andrei Tarkovsky’s adaptation of the Stanislaw Lem novel Solaris, only the psychological confinement is created not by a craft but paradoxically by space itself.